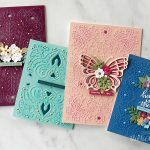 Hi there – thank you for joining me again to learn a little more about the stunningly versatile ColorSticks from Jane Davenport and Spellbinders. 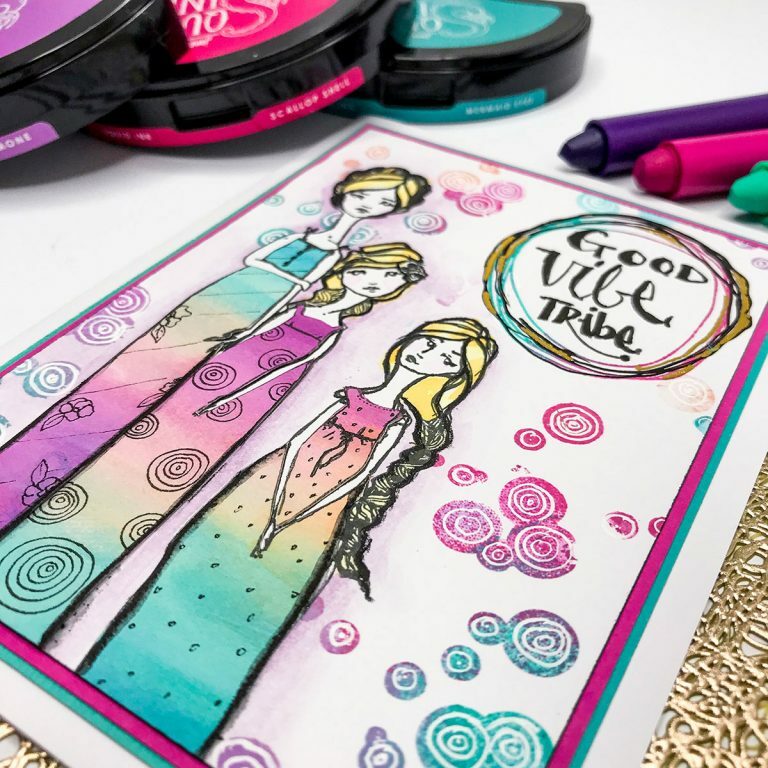 Today I’m going to show you a few different techniques that you can use to make a bright and beautiful card just like this one. 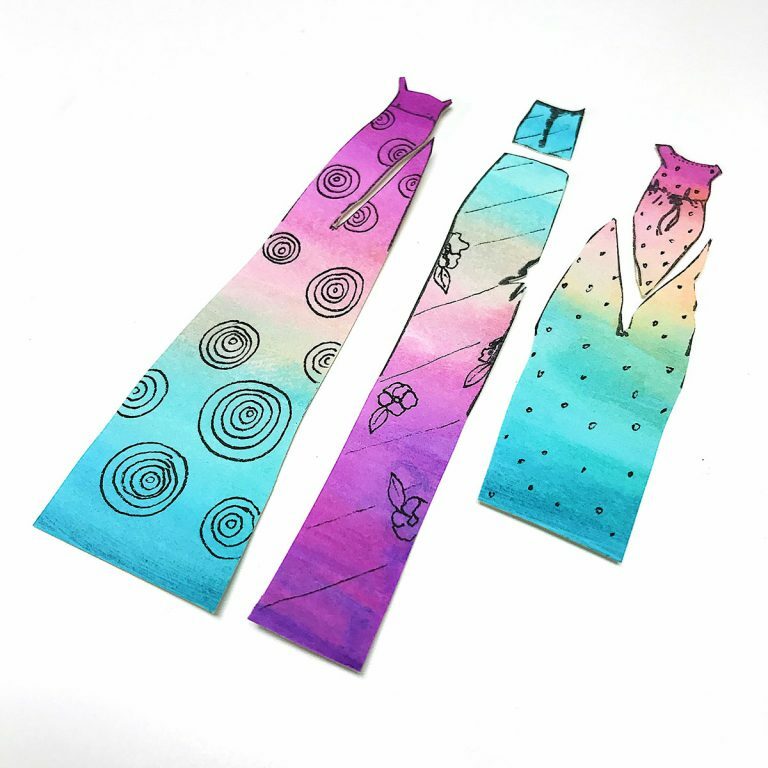 For those who don’t know me, I’m Kate Palmer, Aussie artist and devoted Davenpeep, though I’m better known as Sparkle Tart online because I love all things sparkly! 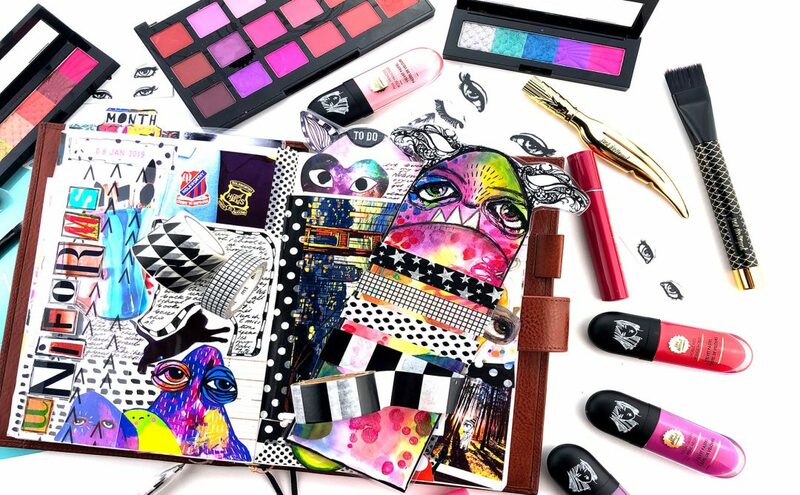 You can find me tapping away on my blog, posting projects and techniques over on YouTube or sharing snapshots over on Instagram (@k8palmer or @planningwithsparkletart) – I love to share and I can’t wait to show you what I’ve created for you all today! Shop Jane Davenport Making Faces Collection at Michaels and Jane Davenport. 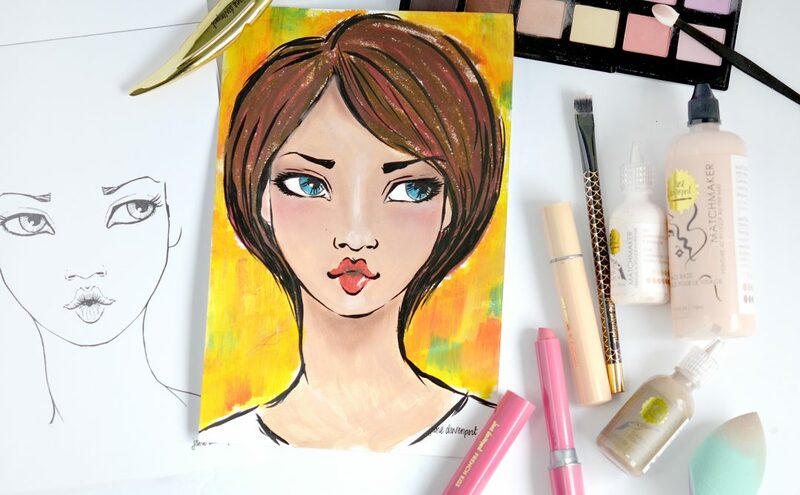 You might have seen my previous post where I colored a very simple face using Jane’s product range and one of the main products I used were ColorSticks. These are glorious creamy sticks which dissolve in water creating a beautiful transparent paint. 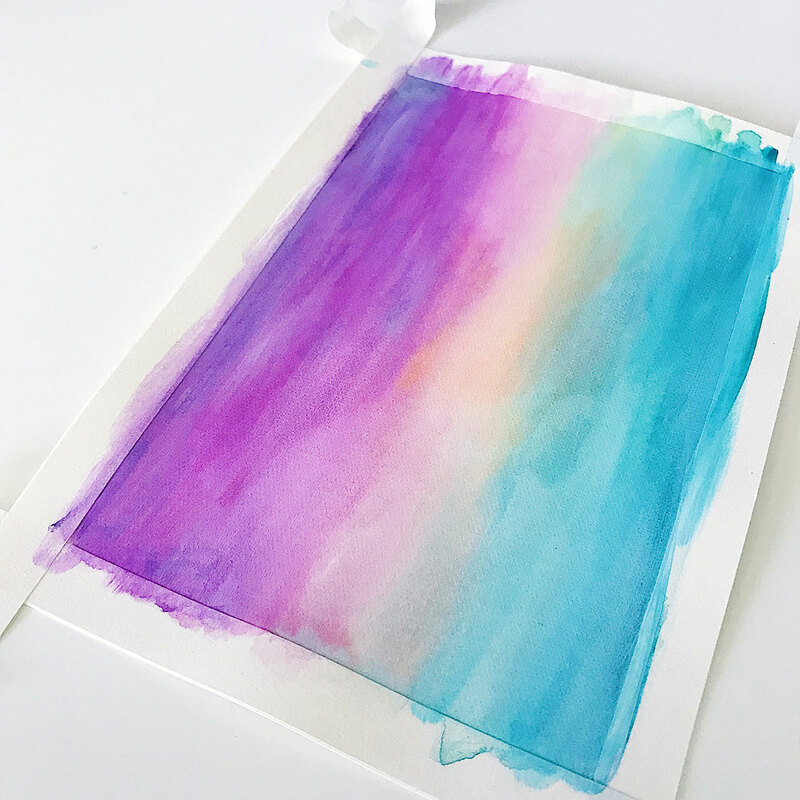 There is so much more you can do with these, so I thought I’d show you one of my favorite ways to use ColorSticks to make a background that you can use for a card, page, tag well anything! Now it’s not super easy to show you the entire process in photos so I’ve made a short video to show you what I’ve done to add the color to the background and create this card, I also have a few basic steps below in case you prefer to wing it. Step 1: Cut watercolor card to size and tape onto work surface. Scribble on various ColorSticks from the bright Soul Window set making sure to overlap some of the colors – I’ve created a very rough H shape of color. Use a small wet Magnetic Personality Brush to activate the color and blend roughly until the entire piece of card is colored. While still damp apply a small amount of gesso onto the card and use a dry brush to blend the gesso into the colored background and allow to dry completely. The color will darken as it dries. 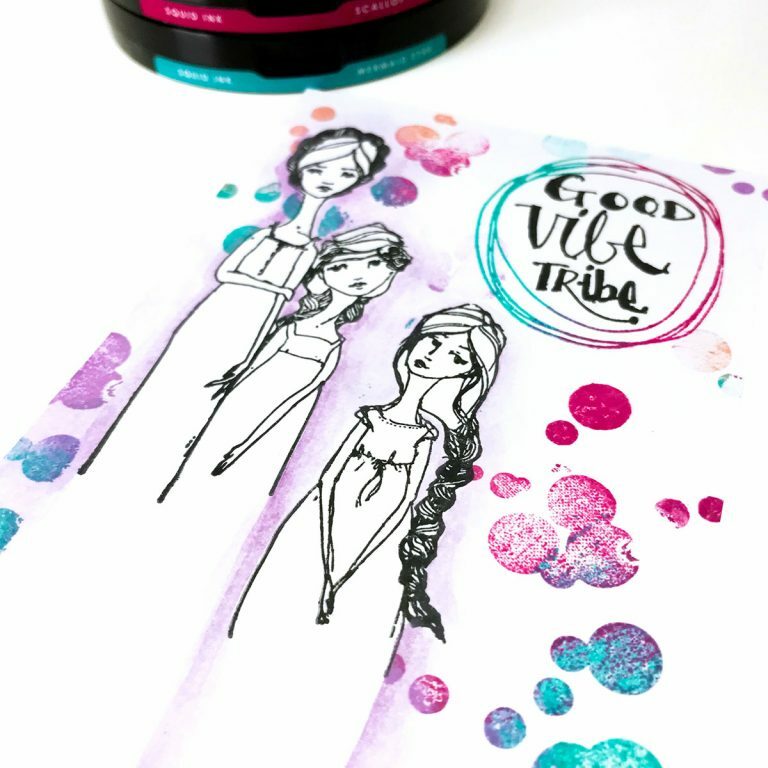 Step 2: Using Janes gorgeous Friendship girls and Cave Black Squid ink – stamp images 3 times each. 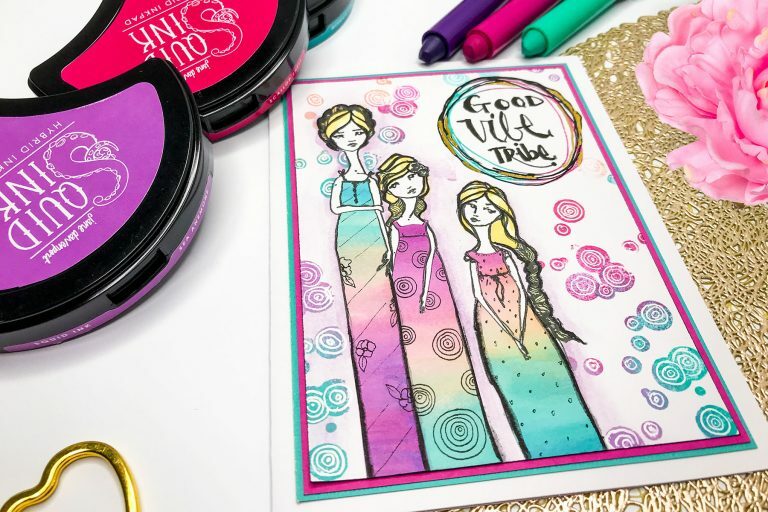 Once onto your colored background, once onto some scrap paper to make masks and once onto your card front (this will be the position of your images on the finished card). 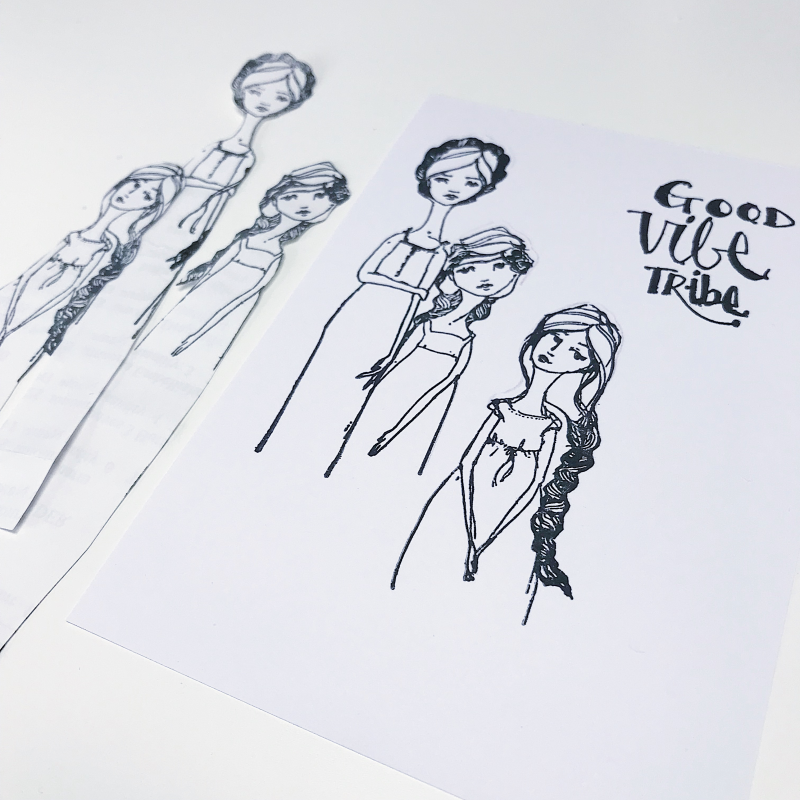 Step 3: Carefully cut the dresses out from the colored card and the full stamped designs from the scrap paper. 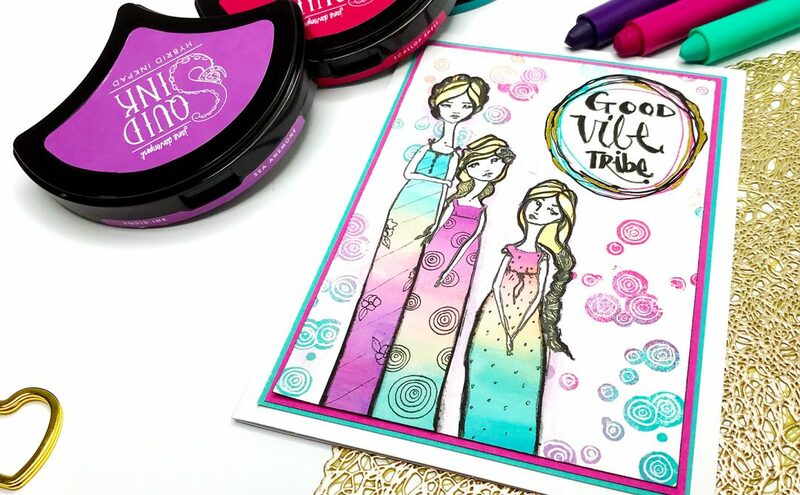 Step 4: Cover images on the card front with pre-prepared masks, then using several colors of Squid ink (JD-032 Mermaid Eyes, JD-004 Scallop Shell, JD-005 Sea Anemone, JD-034 Sun Kissed and JD-037 Squid Ink Cave Black) – stamp dot pattern and Good Vibe Tribe words over the card. 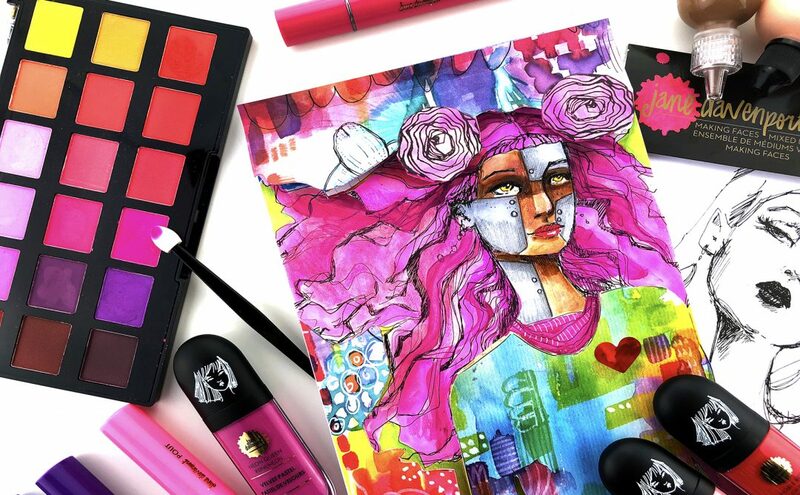 Outline the girl images in purple using both a watercolor pencil and ColorSticks. Step 5: Glue the colored dresses onto card front and trim off any overhanging pieces. 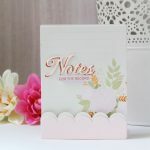 Edge the card front in black by gently running the Cave Black ink along each edge. Step 6: Add small bits of glue using a glue pen and when almost dry cover in gold foil. Mount onto coordinating colors of backing card and you are finished. 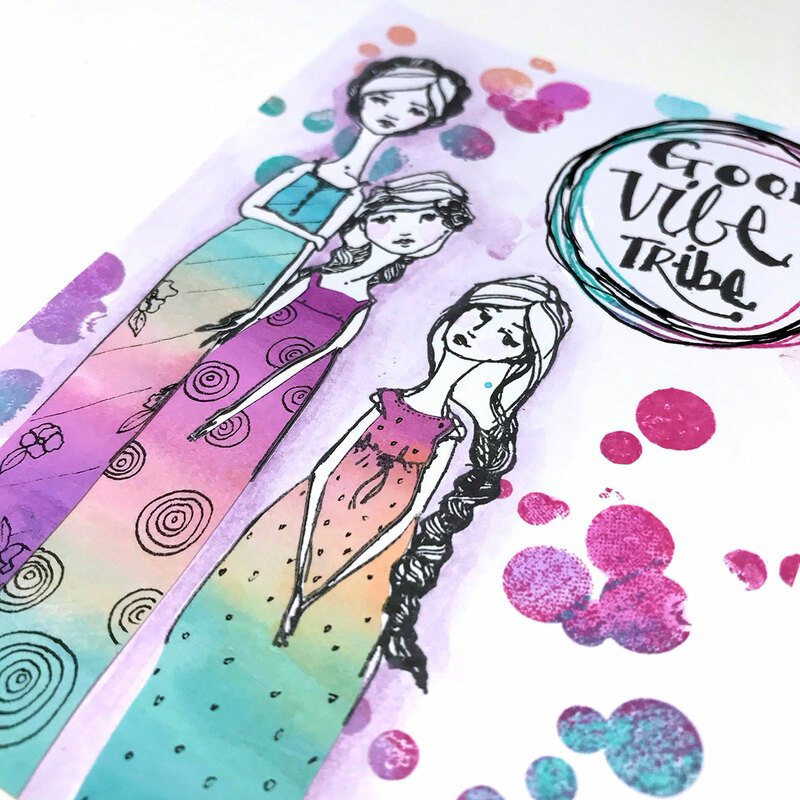 Thank you so much for joining me for a play with my new Jane Davenport ColorSticks from Spellbinders, I hope this gives you a few more ideas for using all those pretty colors to create something of your very own! 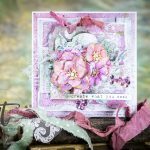 Remember to search the Spellbinders blog for other great ideas using Jane Davenport supplies, my fellow teamies share the most amazing ideas!